EDI units produce consistent on-spec water continuously, minimum 10mega-ohm resistivity. 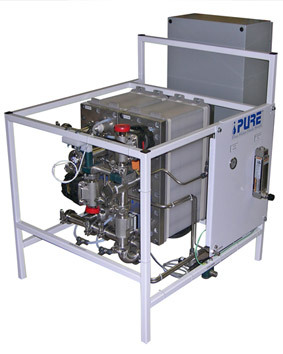 Each unit is delivered completely assembled, factory tested and ready for field installation, which means you can start producing on-spec water quickly. EDI cell resins require no costly chemicals and no time-consuming shutdowns for regeneration. EDI modules are the smallest and lightest units per unit flow volume processed. Units are energy efficient as well.